One of the most loved species of cultivated Bonsai, the Pomegranate has a rich historical and mythical lore. The leaves are opposite or sub-opposite, glossy, and narrow oblong. The Pomegranate flowers are bright red. The Socotran Pomegranate has pink (not red) flowers. Pomegranates are drought tolerant. If too wet, root decay results from fungal infestation. The Pomegranate is tolerant of moderate frost, down to about 14º F. The name Punica is from the Phoenicians who were active in broadening its cultivation, partly for religious reasons. Pomegranate trees like full sun in the summer, less in winter, but still full light as an indoor plant. Leaves can withstand temperatures down to 14º F but the roots dislike freezing temperatures. Grenadine syrup is thickened and sweetened Pomegranate juice used in cocktail mixing. The ancient city of Granada in Spain was renamed after the Pomegranate during the Moorish period. Bonsai trees live in small pots and their world dries out much quicker than plants in the ground or in bigger pots, so close attention should be paid to watering. Striking a balance between not enough water and too much water can be a bit tricky but is very important. Water thoroughly, keeping it damp but not wet. Reduce watering in the winter. An old bonsai watering trick is to place the entire pot in a sink of water an inch or two deep and let the water absorb from the holes in the bottom of the pot. The Pomegranate tree may benefit from weekly misting. An inexpensive moisture meter takes the guesswork out of watering. We sell them on our web-site. Water slowly so it absorbs into the dirt, otherwise the water will run all over your table. We pot our bonsai trees specifically to drain well, so it’s almost impossible to over water. Fertilizing a bonsai is essential to its health because the nutrients in the soil leave very quickly with the water. When new growth appears in the spring, it’s time to start feeding your bonsai. Use a liquid bonsai fertilizer or half-strength general purpose plant food every two weeks from spring to autumn. Do not fertilize for three months after repotting. The Pomegranate tree can benefit from an addition of pulverized organic fertilizer in mid-spring. To develop the foliage, pinch out the tender new, usually green, shoots using your fingers cutting to first or third couple of leaves. If you want new shoots, allow them to mature to a branch length longer than you eventually want it to be and then shorten it later. There may be some natural die-back which may affect the design of the tree. Use the thinnest training wire that will hold the branch in the desired position. DO NOT WIRE A BONSAI JUST AFTER REPOTTING. Wind the training wire in the direction the branch is bent in order to keep the wire from loosening. Wrapping the wire too tightly will case scarring. Begin at the base of the Bonsai tree and slowly wrap the wire around the trunk to anchor. Continue along the branch you wish to train. Repeat the process as needed. Repot Pomegranate trees in late winter remembering to prune roots only moderately. Generally, repot every 3 to 4 years. Insect pests of the pomegranate include the pomegranate butterfly Virachola isocrates and the leaf-footed bug Leptoglossus zonatus. We recommend Orthenex or an insecticide with Acephate, Resmethrin, or Triforine always using the weakest insecticide possible that will address a particular problem. We recommend spraying your Pomegranate tree every few months with a non-toxic insect spray, but DO NOT SPRAY WHEN SOIL IS DRY. Scale is usually identified by brown or black bumps on the branches. These bumps contain insects under a protective waxy shell. A very sticky secretion that discolors the branches may also be present. Pomegranate trees are also susceptible to mold problems which are more likely during the dreary, wet fall and winter days and into soggy spring days. Use a mild fungicide and keep the air flowing to chase away mold problems. 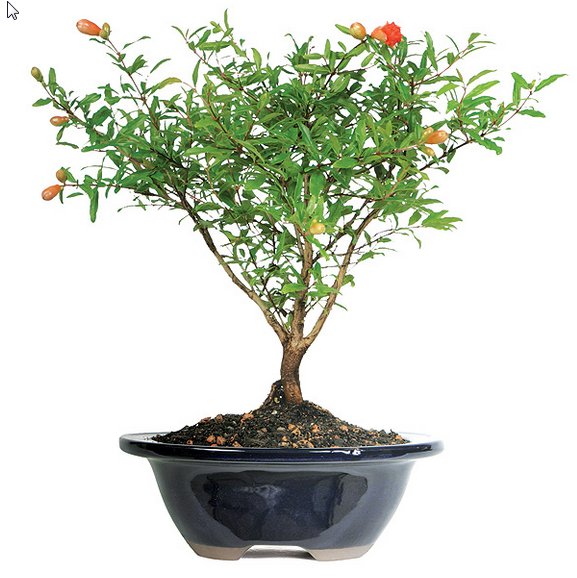 Purchase a Pomegrantate Bonsai Tree right here!